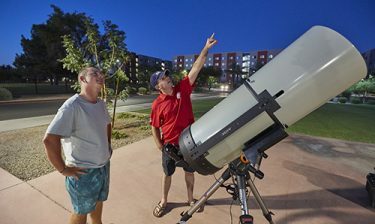 GCU student Brent Phillips looks through his telescope. When light fades and stars shine, Brent Phillips is at peace. But it wasn’t always that way. Phillips, a 36-year-old Honors College senior at Grand Canyon University, had his future stolen from him. The Marine had plans to put 20 years in with the U.S. Armed Services before starting a career in law enforcement. He wanted to follow the multiple generations of his family who have served the San Bernardino, Calif., community. That is what he was supposed to do. That is who he was supposed to become. Kris Phillips, Brent’s mother, cries through her words when she talks about what happened to her son. 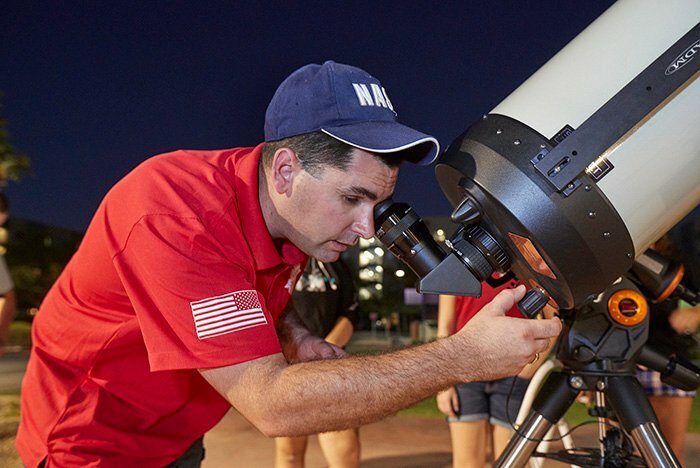 But she’s so proud of what he’s doing now — operating a solo astronomy outreach aimed at easing veterans’ stress and sparking children’s interest in science and math. “He shouldn’t have survived what happened to him, but by the grace of God he did,” she said. “He was lost and he was trying to find something more permanent than himself, something that justified himself. He felt that he owed it to other people and other soldiers and other Marines to help them come back from the brink. 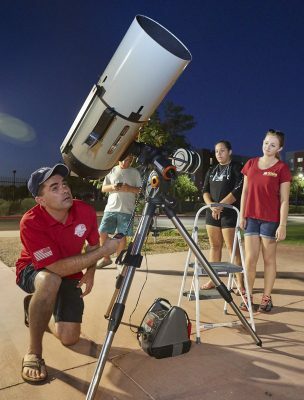 Brent Phillips sets up his telescope for high school students to look through. In 2003, Phillips was among the “first across the berm” in Iraq. He was ambushed in a city outside of Baghdad — hit with four rocket-propelled grenades and a bullet in the arm. He lost an eye, was discharged and was told he could never work in law enforcement because of his physical and emotional injuries. Phillips had dropped out of high school to join the Marines. He had no backup plan. His life, as he knew it, was over. All he had to pick up the pieces was his General Education Diploma. So he enrolled at a community college with aspirations to work with the Kepler Space Telescope Program, but his traumatic brain injury prevented him from being able to do the necessary complex math. Phillips switched gears to become a history teacher and transferred to GCU, which he says is the only university in the state that offers the setting he needs to thrive. The combination of GCU’s smaller class sizes and the veteran support was just what Phillips needed. 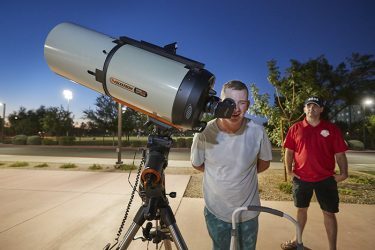 A GCU student looks through Brent Phillip’s telescope. Phillips calls his telescope “a portal to the past” because stars are so far away that what the eye sees is actually a snapshot from hundreds of thousands to millions of years ago. Astronomy, however, has become more than just a childhood fad. It started as a way to curb his post-traumatic stress disorder and blossomed into a purpose when he was hired at the Challenger Space Center as a weekend manager. It was on a day about a year ago that he was looking through his scope and had an idea that’s carried him to the present. Under the light of a star named Vega, he came up with the idea to start an outreach organization to help veterans and children. He figured that star would make a fitting acronym: Veteran Education Group Astronomy. In April, VEGA Outreach won top prize at the GCU Honors Showcase Symposium. Phillips presented to GCU President Brian Mueller and has partnered with the University for marketing and grant writing. He has hosted multiple events for veterans and has visited at least 25 Arizona schools. Brent Phillips points to Jupiter. Phillips often gets to enjoy individuals’ self-discovery. For most people, his scopes are their first time seeing planets and stars up close. Phillips’ mother says “the sky is the limit” for her son’s organization. Phillips learns something new from astronomy every day. He doesn’t plan on slowing down with it anytime soon. Thats’s great to discover yourself through astronomy.